The GOPLUS Hydraulic Log Splitter has 6 tons of splitting with 1500W of power. It is made from good quality material to ensure the durability of the product. This hydraulic splitter can be used to split log for fireplace as well as for wood stoves. It can also be used indoors or outdoors for splitting logs. This specific model can split logs that are 20.4 inches in height and 9.8 inches in diameter. This means that the GOPLUS Hydraulic Log Splitter will be able to split logs of different sizes without any problem. 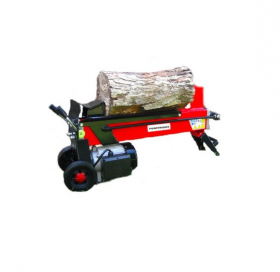 It is a standard duty log splitter but is a decent option for splitting logs for private use. However, it cannot endure heavy duty work or thicker logs. If you use softwoods you will be able to finish the job without a problem. But this splitter will not be useful for hardwoods or wet wood. It will also help you with splitting logs if you need wood for other projects. The GOPLUS Hydraulic Log Splitter is a splitter made from fine quality material, provides sturdy surface for splitting and lets you cover log splitting in a short time. It is affordable and features log-cradle to guard the logs after they have been split. It has 6 tons of splitting energy. It has 1500W of power. It is sturdy and made from durable material. It is a standard duty splitter. The ARKSEN Hydraulic Log Splitter features a 2 HP electric motor which provides heavy duty splitting of logs. It has 7 tons of power that will be applied to split the log. With the help of this splitter, you will be able to get the job done within a short time. Whether you need logs for professional use or private use, you can achieve fast results with help of this electrical hydraulic splitter. 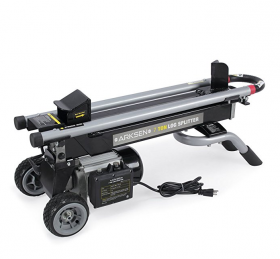 In addition, the ARKSEN Hydraulic Log Splitter is designed to let you split logs while maximizing your security. Anyone including older people and even teenagers will be able to maneuver this tool without any risks. It includes built-in side rails which are meant to keep the logs from falling off when they are split. This feature simply enhances your working experience. In short, it can be said that the ARKSEN Hydraulic Log Splitter is one of the simplest and safest splitters to use. It has adequate incorporation of power which allows its user to split log with efficiency in a reduced amount of time. In addition to that, it is a standard duty splitter that can be used for cutting hardwood as well. It is expensive but it is durable and will last you for quite some time. It has a 2 HP electric motor. It applies 7 tons of power to split logs. It can be used for hardwood. 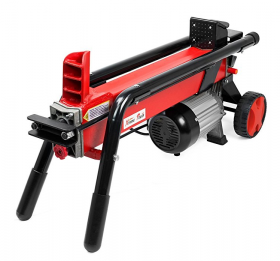 The Powerhouse Hydaulic Log Splitter is a heavy duty splitter with a 3 HP electric motor. It has 2500 watts of power along with the splitting force of 7 tons. It has been designed to make sure that you can work without running out of gas by keeping in mind professional aspects. It can split logs which are as long as 20 inches and 12 inches wide. You can use this tool indoors or outdoors to get logs for the fireplace or a wooden stove. This heavy duty log splitter will be useful for cutting softwoods and hardwoods in a short time.Additionally, it is a safe splitter that anyone can use regardless of their age. When you remove your hand from the level it will retract in order to let you load another piece of log. The Powerhouse Hydraulic Log Splitter features a time and effort saving mechanism which allows you to get more logs in a shorter span of time. It has a heavy duty motor so you can perform without the motor tripping. Moreover, it can split through fairly thicker and harder logs. It is quite expensive compared to others but because of its heavy duty performance and durable structure, will make it worth the money you spend. It is a heavy duty splitter with a 3 HP motor. The lever automatically retracts to make space. The Titan Greet Outdoors Hydraulic Log Splitter is a unique splitter as it offers numerous qualities that you will not find in others. For instance, it has a log-lift option so it will load heavy logs on its own instead of you having to lift the heavy piece personally. In addition to that, it offers maximum convenience to users by letting them start the motor with a pull or electric-start option. It features a 420 cc engine to enhance the efficiency of splitting. This splitter will be ideal for hardwoods and wet wood without running out of working capacity. It applies 11 gallons of force on the log to split it which is another characteristic worth noting. The Titan Great Outdoors Hydraulic Log Splitter is made from strong material that can endure the weight of logs yet remains sturdy even after seasons. As such, is considered one of the best options for professional log providers or crafters. 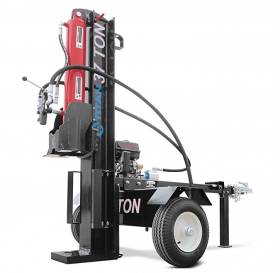 This hydraulic splitter combines great force with efficiency and user friendly techniques to expand your working capacity and enhance experience. Furthermore, assembling does not require too much time and you will be set to work within minutes. It is a very expensive tool for that matter too. It applies 11 gallons of force on log. It has a log-lifting mechanism. It can be started with electric or pull. It is a highly expensive high end tool. The WEN Hydraulic Log Splitter features a durable 2 HP motor that is copper-wound to increase its longevity. It is specially designed to be used for private and household use so you won’t need gas or generators to run this machine. It is a quieter and fume-free machine which adds to its appeal. Besides this, it enhances the safety spectrum by letting you take hands away from the ram. You can use this machine to split logs that are 20.5 inches in length and 10 inches in diameter. It incorporates a log-cradle for neat finish after the log has been split. This model comes with tires making it portable and easily adjustable. You can move it around to take it in and out of storage. The WEN Hydraulic Log Splitter is ideal for splitting log for kindling and stoves. It is a standard motor which is ultra-durable because of copper-winding. In addition to that, it is an affordable machine so is easier to purchase. It is equipped with a durable motor and log-cradle so it will come in handy for splitting logs indoors and outdoors with high quality performance. Finally, it has the capacity to split a good amount of logs without tripping. It has a reliable 2 HP motor. It is equipped with a log cradle. The Generic Hydraulic Log Splitter can split logs which are 20.5 inches in height and 10 inches in diameter. It applies 7 tons of RAM force on the log to ensure that it splits perfectly to be used for stove and fireplace. In addition to that, it has 7 wheels for portability that allows you to move it around quite easily. This machine incorporates a heavy duty 2 HP motor for longevity and is designed to come in handy for household use. It is a standard duty machine that will let you split logs for a long time. The Generic Hydraulic Log Splitter is an average machine that will reduce the time and effort you usually spend on splitting logs. It is adequate in size and easy to move around for storage options. This is an electric splitter so you will not have to bother with gas or generators. Simply connect it with the house power for electricity to start splitting logs. It is affordable in price and offers optimum services of log splitting to users. In short, this is a basic hydraulic log splitter that has sufficient capacity to perform the task. It can split 20.5 inches long logs. It exerts pressure of 7 tons RAM. It is an ideal machine for domestic use. It is a standard quality splitter. This log splitter is a chemical resistant machine that will not wear out with the use of water, mild acids, and salt water. It exerts a force of 154 gallons splitting hardwoods and wet wood easily. 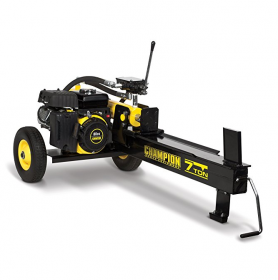 The Champion Power Equipment Hydraulic Log Splitter has 196 cc engine that works fast and retains durability. It will split logs without tripping and you will be able to use it for a long time. 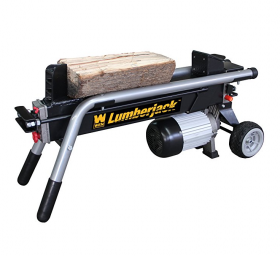 This heavy duty log splitter is made from hardened steel which makes it sturdy and strong. In addition, it has a 2-stage gear pump to adjust the flow so you can split through softwoods and hardwoods easily. You can manage the amount of pressure that it will use for every log that you split. You can run 180 cycles in one go which allows you to split more logs in short time. This machine can be used for professional log splitting because it is high end with an excellent level of efficiency. The Champion Power Equipment Hydraulic Log Splitter is an expensive tool which has been used by many customers who appreciated the quality of this machine. Additionally, it is easy to assemble and you can put it together within minutes before you start splitting. It has a force of 154 gallons. It has 2-stage gear pump. You can do 180 cycles in one go. It is an expensive splitter. The Titan Hydraulic Gas Splitter gives you the option to pull start or electric start the machine. It has a 2 ball which allows the user to tow a heavy piece of log. 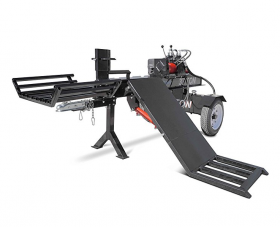 In addition, you can split logs vertically or horizontally with help of this machine. This machine is made from heavy duty steel which ensures the capacity and durability. Plus, it has thick valves and hoses to make sure that it will not simmer with workload. It applies 37 ton of forced on the log to make sure it splits without jarring or tripping. You can use it for softwoods and hardwoods including wet wood which becomes more rubbery in texture and harder to split. 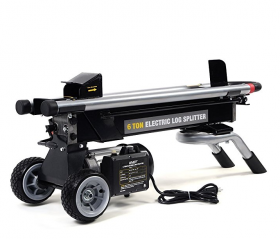 The Titan Hydraulic Log Splitter can be assembled within minutes. It is adequate in size so you can use it indoors and outdoors. It can also be used for professional use because of its heavy duty built and performance. However, all these qualities do not come without a cost and as such it is a bit expensive which can be the only possible set back of this log splitter. Otherwise, it has been a favorite machine among customers who have used it for kindle or stove. It exerts 37 tons of power. It is made from heavy duty steel. The price might be a setback. To conclude, there are various hydraulic log splitters with standard duty and heavy duty performance. The price of most splitters is dependant not only on the force of work but also additional features. If you want to buy a splitter you can consider the work load, capacity and other such details to make a purchase that you are satisfied with.